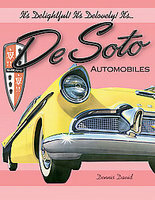 DeSoto car books covers the history of DeSoto and advertising, plus many manuals. The DeSoto (sometimes De Soto) was a brand of automobile manufactured and marketed by the Chrysler Corporation from 1928 to 1961. De Soto 1952-1960 by R M Clarke (2000). 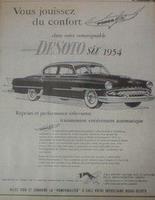 DeSoto announced the new Firedome in 1952. The new V8 engine gave good cruising capabilities with comfort. Ghia designed a new Adventurer for 1954. A convertible was introduced in 1956 with a sportier look and more power. The body was drastically re-styled for 1957. The body was also completely new for 1960 with the switch to unit bodyframe construction. The 383 engine was available for the Adventurer models. This is a book of contemporary road and comparison tests, model introductions, consumer analysis, technical and specification data and driver's impressions. Models include: FireDome 8, Powermaster 6, Adventurer, FireFlite, Indy Pace Car, Firesweep, Diplomat and Wagons. It's Delightful! It's Delovely! It's DeSoto Automobiles by Dennis David (2006). Between DeSoto's introduction in 1928 and its demise in 1961 would come 32 years of wonderful styling, bright colours and power to spare. DeSotos were billed as 'a lot of car for the money'; and sales proved it. DeSoto was purely an American effort. One look at the graceful flying lady mascot on the hood of a DeSoto S-11 is all it takes to see that it was a different era - a time in American automotive history that is forever gone. Revisit this era in a concise history of this magnificent marque. 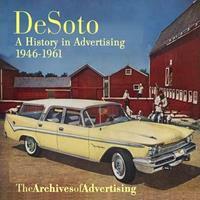 DeSoto: A History In Advertising 1946-1961 by William McBride CD ROM (2001). The history of the car from 1946 to 1961 as portrayed in its maker's magazine and newspaper advertising. From those great fluid drive DeSotos of the late 40s through the finned wonders of the late 1950s, DeSoto made some of the most rugged and dependable cars in the postwar years. Dawn Of Destiny: Styled For Tomorrow 1955 DeSoto. This was a promotional book that was given to auto dealers advertising the new 1955 DeSoto. 1954 De Soto Automatic With Powerflite Transmission 1953 Sales brochure for 1954 models. 1942 DeSoto (1941) This vintage piece of automotive ephemera opens up to display full colour illustrations of 13 models from the 1942 DeSoto Custom and DeLuxe series including the Custom Convertible Club Coupe, DeLuxe Business Coupe, etc. The insert pamphlet features information on DeSoto's Personalized Interiors and "Special Fifth Avenue Ensemble".